There are times when we edit prose in Vim, such as in a project README or git commit message. In those cases, we can use Vim’s spell-checking to help us avoid embarrassing mistakes. The highlighted words are considered misspellings. It would be tedious to manually turn on spell-checking each time we need it. Luckily, we can guess by convention that we’ll want to spell-check certain files. 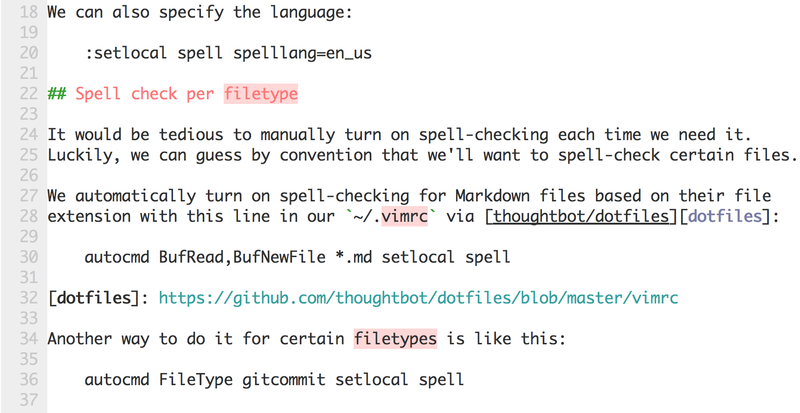 By turning on spell-checking in our ~/.vimrc, we’ll be turning on word completion as well. The following command will let us press CTRL-N or CTRL-P in insert-mode to complete the word we’re typing!